851689 Catwoman Minifigure Magnet Set is a Batman Magnets set released in 2007. It contains Robin, Catwoman, and The Joker. This is a description taken from LEGO.com. Please do not modify it. Add more Batman magnets to your collection! 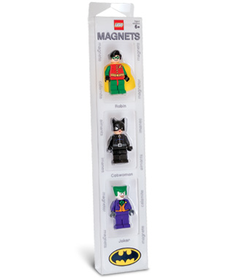 Collect all of the LEGO Batman magnets! This set includes The Joker, Catwoman, and Robin minifigure magnets. Includes headgear! Facts about "851689 Catwoman Minifigure Magnet Set"
ShopDescription Add more Batman magnets to your collection! This page was last edited on 9 January 2016, at 23:36.